Detroit, Michigan - Lawn mowers are ready for volunteers to use in cleaning up a distressed neighborhood during a week-long community improvement initiative called Life ReModeled. Volunteers from churches, businesses, and other organizations cleaned yards and streets, boarded up vacant homes, and repaired an old school. 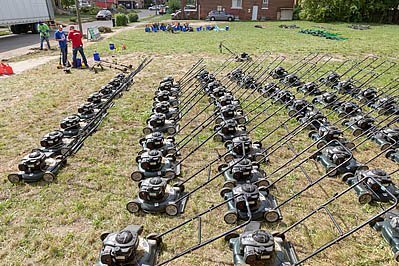 Image Description: Detroit, Michigan - Lawn mowers are ready for volunteers to use in cleaning up a distressed neighborhood during a week-long community improvement initiative called Life ReModeled. Volunteers from churches, businesses, and other organizations cleaned yards and streets, boarded up vacant homes, and repaired an old school.